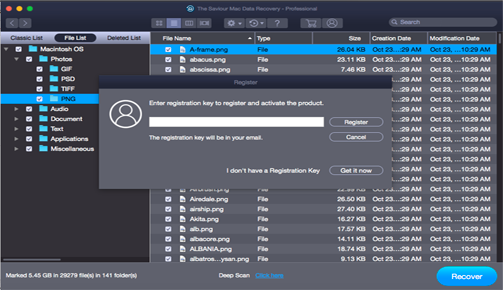 Mac Data Recovery Software to Recover Lost or Deleted Data on macOS. Mac Data Recovery made Easy! Now you can easily recover your lost or deleted Mac data from missing volumes and corrupt or formatted hard drives with The Saviour Mac Data Recovery software. 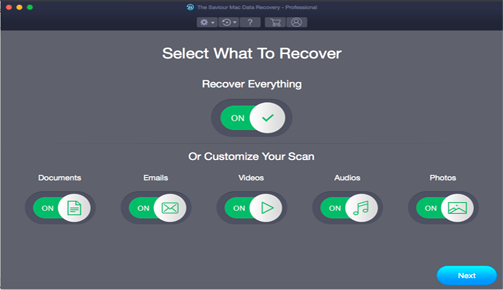 Select "Recover Everything" to recover lost or deleted Photos, Videos, Documents, Audio & Emails, etc. from your Mac. You can also customize Mac data recovery for specific file types. 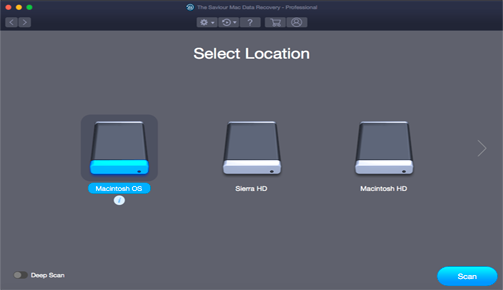 Select the Mac hard drive from where you wish to recover your deleted or formatted data. You can also scan your selected media using the advanced "Deep Scan" mode. Select all the recoverable files such as photos, videos, music, documents including Word, Excel, PowerPoint, PDF, TextEdit, etc. and Email data file & save them at the desired location. Why the Saviour Mac Data Recovery Software? When faced with a data loss situation, Data Recovery Software becomes the need of the hour! 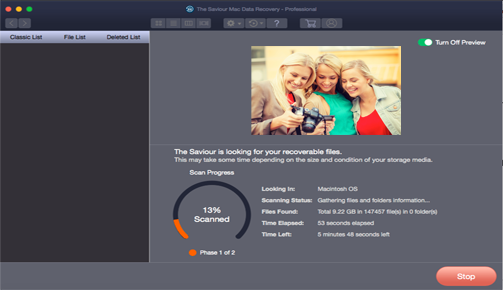 The Saviour Mac Data Recovery software recovers the lost or deleted data in 3 easy steps – Select, Scan & Recover. What's more! With this software, you can recover 100+ file types and supports all storage devices such as SSDs, SDs, Internal & External hard drives, etc. The Saviour Mac Data Recovery deftly recovers your lost or deleted data from corrupt or damaged volumes or formatted drives. Its Deep Scan feature runs an extensive search on the impacted drive or partition and brings forth the recoverable items which you can save at a location of choice. Accidentally deleted your files? Worry no more! With The Saviour Mac Data Recovery software, recover your deleted files with ease. All you have to do is select the file type(s) that you wish to recover, scan the drive or volume, and proceed to saving the recoverable items. With The Saviour Mac Data Recovery, you can seamlessly restore files emptied from the Mac Trash Can. This software enables you to undelete your accidentally deleted files from the "Trash folder" even when the trash is emptied deliberately or otherwise! Leverage The Saviour Mac Data Recovery software when your Internal/External Mac hard drive is unmounted, not getting recognized, or enclosed files are at risk. This Mac hard drive recovery utility uses advanced algorithms to recover data from the hard disk drive. Lost your backup files from the Time Machine external hard drive? Worry no more! The Saviour Mac Data Recovery software will list your Time Machine as a normal hard drive, after which you can scan and recover all the once deleted backup files and relocate them safely to a new drive. Lost or accidentally deleted your priceless photos, videos, or music files? Look no further! 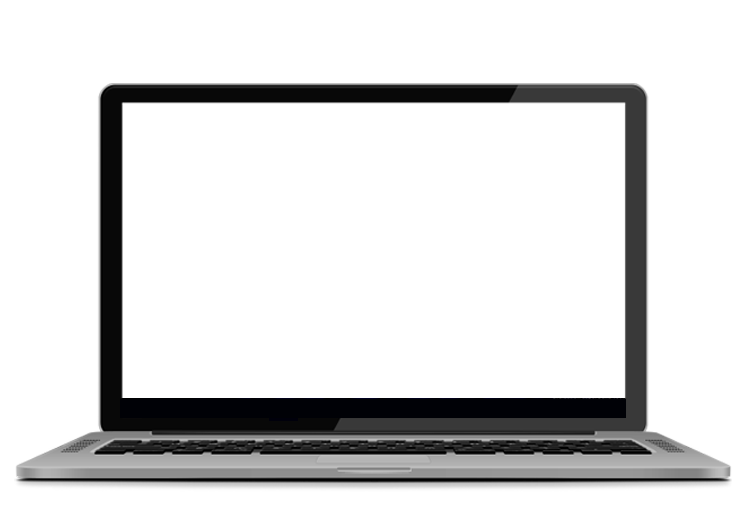 With The Saviour Mac Data Recovery, you can customize the scan and recover just the videos, audio, and photos file types using the default or the Deep Scan mode. Is your Mac Partition or Volume unavailable? The Saviour Mac Data Recovery software is equipped with an advanced "Can't Find Volume" feature which will specifically search your Apple Hard Drive or SSD to locate Lost Volume(s) for recovering the enclosed files. 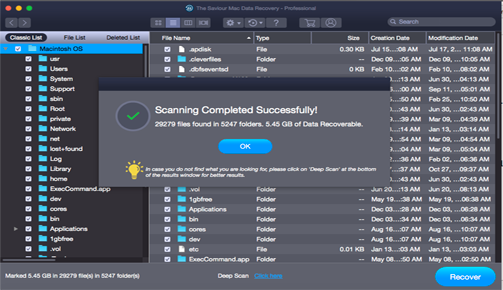 Now recover your deleted files through The Saviour Mac Data Recovery software built-in Deep Scan option that evaluates every sector of the hard drive to restore lost files and folders. You may also opt for the default Scan option in case of a non-critical data recovery process on Mac hard drive. I downloaded the trial version, which scanned and indicated it could recover 130GB of my photos, videos, etc. on the corrupt Mac drive. Happily I went and purchased the product, including the "Volume Optimizer"
Thank you for a great product and great tech service! I never thought the recovery of deleted photos from my MacBook is possible. I have some photos taken during last vacation. I was not able to backup those files. Thanks to you're The Saviour Mac Data Recovery, it recovered my lost photos. How to Recover Deleted Photos, Audio, and Videos from Mac? Select your Mac hard drive and click Next to start the Scan. The recovery process is complete! Can I Recover Deleted & Formatted Files from Time Machine Drive? Answer : Yes! This Mac file recovery software efficiently restores files deleted from Time Machine hard drive. 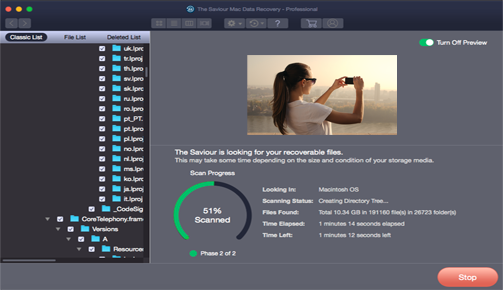 Launch The Saviour Mac Data Recovery software to recover Backups.backupdb folders and enclosed files. How to Recover Data from Mac Connected Through FireWire to Another Mac? Answer :Use Target Disk Mode and The Saviour Mac Data Recovery software to connect and recover data from Mac connected through FireWire to another Mac. Specify the Destination to save the recovered files. The Recovery Process to recover Mac hard drive data through Target Disk Mode is complete! Can I Run The Saviour Mac Data Recovery on a Corrupt Mac Hard Drive? Leverage The Saviour Mac Data Recovery Rescue CD to start-up a non-booting Mac hard drive. Further, select Recover Everything (or customize your Recovery) and choose Macintosh HD. Click Next to start the scanning on Mac start-up disk. After scanning, select the desired files to recover. How to Recover Data from Mac Hard Drive having Bad Sectors? 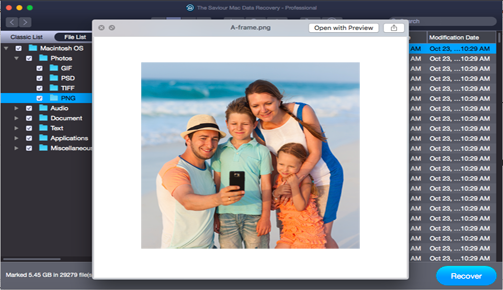 Lastly, resume the Image using Load Image option to recover data from hard drive image This completes the process! Other than HFS, what other file system(s) does this software supports? Answer :This Mac data recovery software supports file recovery from HFS, HFS+, HFS Wrapper, FAT32, ex-FAT, and NTFS file systems. © Copyright 2019 The Saviour. All Trademarks Acknowledged.